While we looked at the Lumix DMC-G2 yesterday, here is yet another fellow Micro Four Thirds camera from the Japanese consumer electronics giant, Panasonic. We’re talking about the Panasonic Lumix DMC-G10 here, where it is touted to be the lightest digital interchangeable lens camera with a viewfinder in the world. Don’t be mistaken though – even though it is the lightest, that doesn’t mean all of its functionalities have been stripped away – no sir, the Lumix DMC-G10 comes packed with a host of advanced digital camera functions that were specially designed to be easy-to-use for users who are new to system cameras. Being compact and portable, the Lumix G10 is also able to record High Definition (HD) video in addition to snapping high-quality still images. 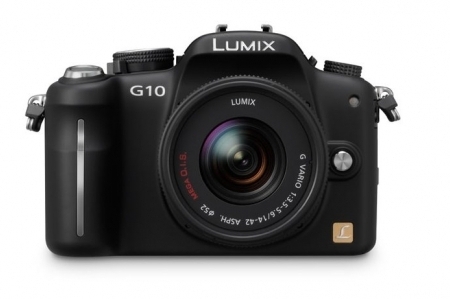 Using a mirrorless structure as part the Micro Four Thirds System standard, the G10 has eliminated a number of components that are found in a conventional interchangeable lens camera, where among these include the mirror box and optical viewfinder unit. Doing away with those allows it to obtain its status as being the lightest system camera in the world, and will feature the newly announced Lumix G VARIO 14-42mm/F3.5-5.6 ASPH/MEGA O.I.S. lens that boasts a versatile zoom range of 14-42mm (35mm camera equivalent: 28-84mm) that makes it a snap to shoot a wide-range of scenes, from dynamic landscape to portrait. Other features include iA (Intelligent Auto) mode, MEGA O.I.S. that helps prevent blurring from hand-shake, Intelligent ISO Control, Intelligent Exposure, Intelligent Scene Selector, recording 1,280 x 720 HD video in Motion JPEG, QVGA, VGA and WVGA formats, an Optical Image Stabilizer (O.I.S. ), Face Recognition function, a Live View Finder at 202,000-dot resolution, a 12.1-megapixel Live MOS sensor and the new Venus Engine HD II. No idea on when it will hit the market, but both pricing and availability details will be unveiled a month before it is ready to arrive in store shelves near you. At least you can have a head start in saving up for one, eh?